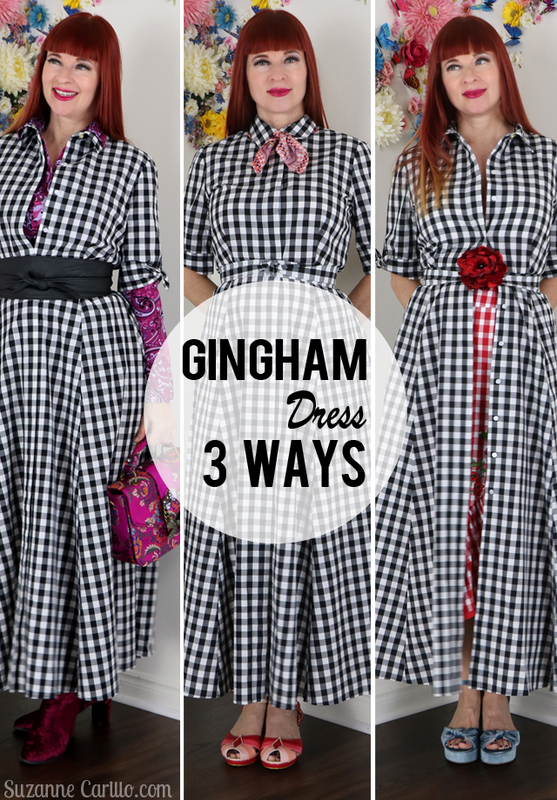 Are you sick of this gingham dress yet? Ha! I had to take a break from this series last week because I was suffering from gingham fatigue. I’m back this week with seven more outfit ideas. Once I got on a roll with this the ideas just kept coming. Don’t worry…I’m only sharing four more outfits today and I’ll share the remainder soon. I’m kind of obsessed with pushing the outside of the envelope so I tried bold florals next to the bold black and white gingham. It’s okay…but it’s not my favourite. This look is a winner. This styling would be better in motion to show off these funky thrifted tights. Plaid and gingham is fun too. This look has a bit of a Mary Poppins vibe which seems to be my go-to lately. This one is a simple outfit but it’s one of my favourites. It is interesting without being overwhelming. 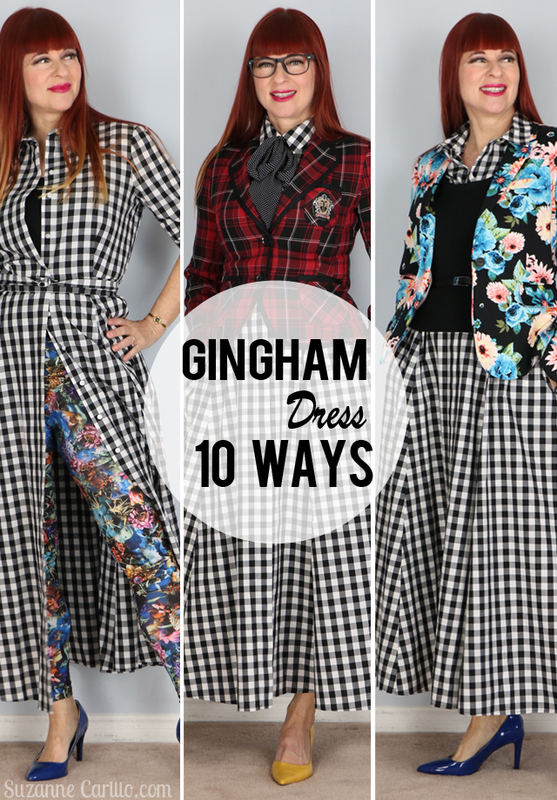 What do you think of these 10 gingham dress style ideas? Which one do you prefer? I still have three more outfits to share with you. I had four but kicked one to the curb. My gingham mojo was suffering a bit at that point I think. 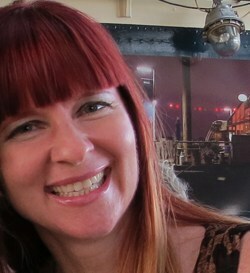 I have to add that I was happy to be included in IFB for their Links à la Mode last week. Online Personal Stylist: 20 Sustainable Fashion Facts that Will Make You Shop Smarter! Online Personal Stylist: Simple Knitting Series: Learn How to Knit Without Needles in Just 5 Minutes! I generally prefer shopping thrift or secondhand clothing however I’m still not 100% immune to the lure of retail. 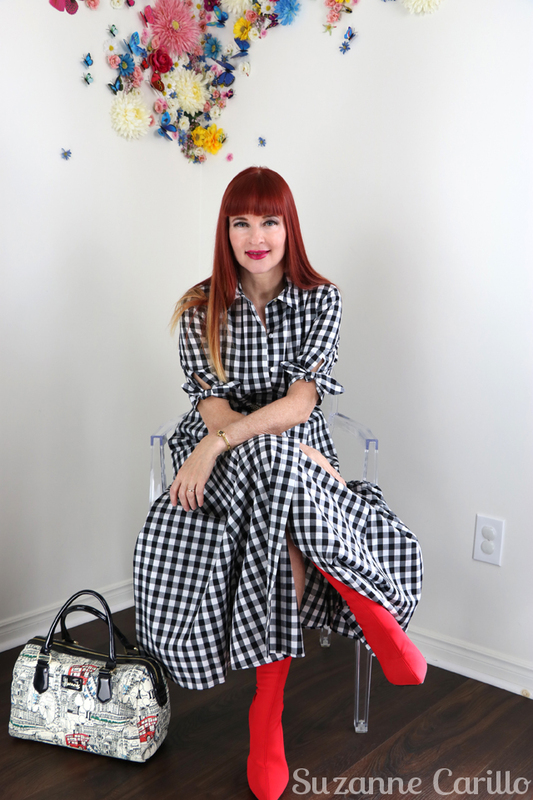 This gingham dress is one of those exceptions that caught my eye when I was taking some home decor back to TJ Maxx. I need blinders on when I go into that damn store to stop me from straying. Of course it had to be gingham for spring. 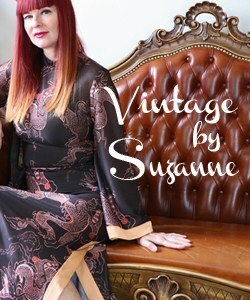 The feminine length and retro vibe of this dress was right up my alley. I was crossing my fingers it would look awful in the fitting room. Needless to say it didn’t and I felt obliged to bring it home so I could make a better informed decision…in front of my camera. As a rule with retail purchases, before deciding to remove price tags and eliminating any possibility for returns, I like to “play” with the piece to ensure it works with the rest of my wardrobe. 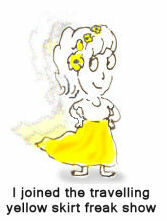 I want to see just how versatile it is going to be for me and my wardrobe. 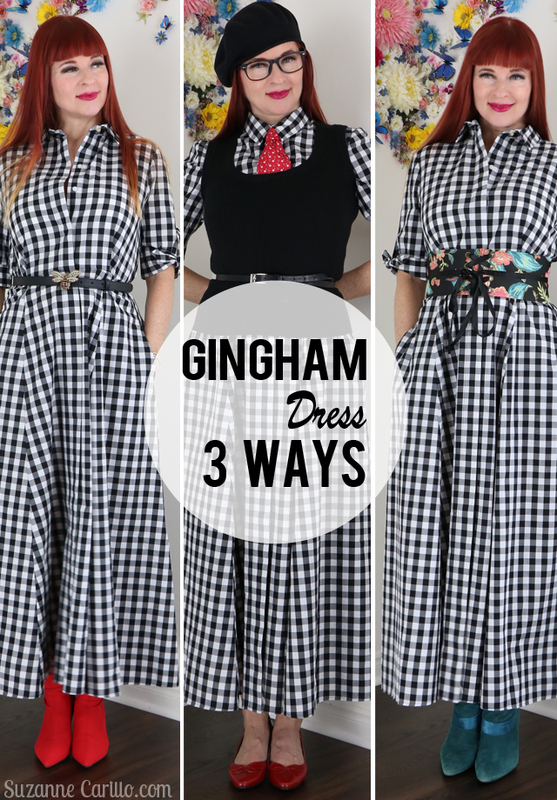 Here are three of the gingham outfits for spring I’ve created. Paired with two gifts from hubby, the bee belt and the bag. There were a couple of concerns I had initially with the dress. The skirt is extra full, with additional panels which can look sloppy and add weight to my frame. The length of the dress is in-between maxi and midi, kind of “ankle grazer” which is a bit odd. It is the ideal length to avoid tripping on your dress when climbing stairs or getting up from a seated position but can visually shorten someone that is already vertically challenged like myself. Of course all of that is mute when sitting. My man servants aren’t currently available to carry me on my chair everywhere so I had to create more outfits and take even more photos to convince myself the length and fullness weren’t deal breakers. This may be one of my favourite looks I’ve created so far. It’s an ideal transitional outfit and it breaks up the print giving the eyes a place to rest. Special thanks to the hubby for allowing me to borrow his red tie. That’s what happens when you’re on the other side of the world…your closet gets raided. Vintage shoes, old beret, sweater and belt. Aldo handbag. Here a larger belt creates a more defined waist. Belt – Anthropologie, Boots – consignment. Which was your favourite of the three outfits? 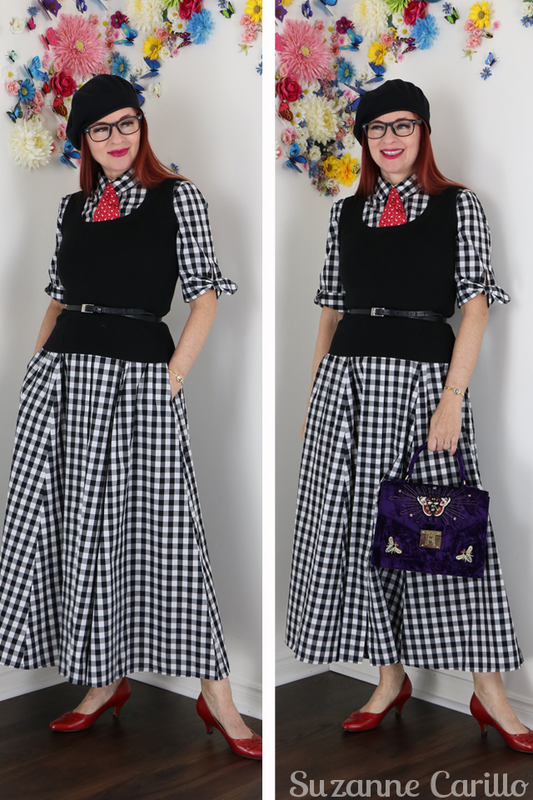 Are you a fan of gingham outfits for spring? 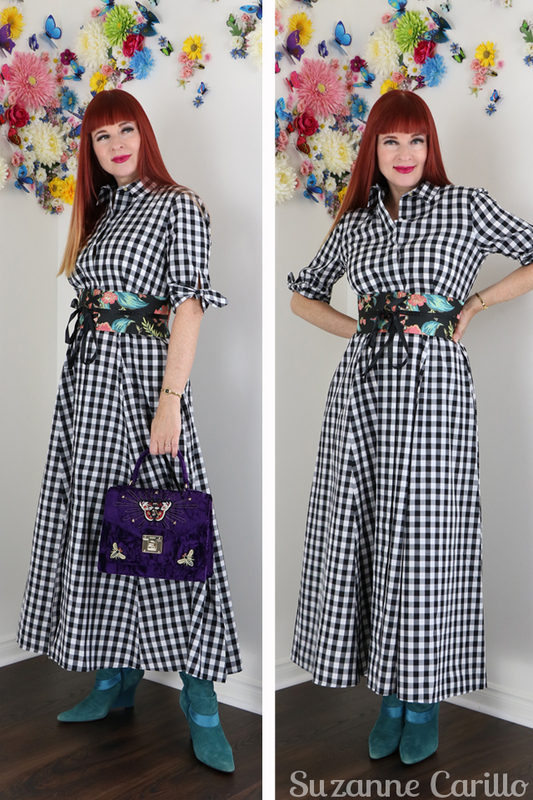 Come back later this week when I share more of the outfits I created with this gingham dress.